The design of this bridge allows for adjustment in three dimensions. Not only is the height and intonation adjustable, but also the individual string spacing. This is a beautiful bridge. The quality is excellent and it offers great adjustments. I bought it as a replacement for my 1970's Aria TA60. I haven't used though. It is my stupidity but although I measured my guitar very carefully this won't fit my guitar as a direct replacement. The mounting bolts supplied with this are a very different size to the ones on the guitar and this is the point. The photos on the website don't show the underneath of the bridge. If they did I would have seen that it is very different to my guitar's existing one. The diagram photo does give very good measurements so I blame myself entirely for this. My only reason for sending this review is to send a note of caution to would be buyers that you may find yourself having to make pretty big adjustments to the body of your guitar in order to make this fit. I'm not confident enough to do this myself so this bridge remains unused. I hope this helps. I have bought two of these now, and found them to be excellent in quality and function. One was for an Epiphone Les Paul, and the small threaded inserts fitted straight inside the bridge post inserts in the Epi Les Paul. Easy to fit and the roller saddles make string positioning and spacing perfect. Intonation was easy and almost dead right as fitted. The second went on a Gibson Supreme Les Paul. The string positioning on the standard bridge left the 1st string further in on the fretboard than the 6th string and it didn't run over the poles on the pickup. (bridge post inserts slightly out of position in the body). 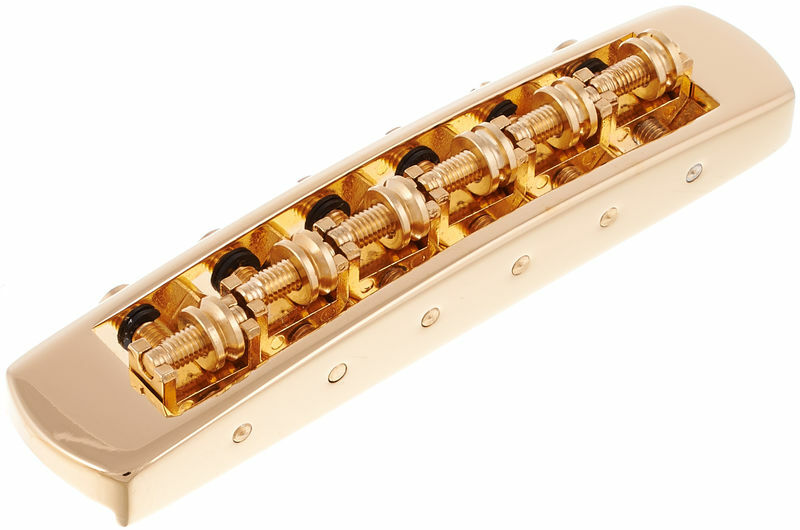 The threaded Schaller bridge posts screwed straight into the Gibson body inserts so was fitted easily in minutes, and the adjustable roller saddles allowed me to set the perfect string position and spacing. Brilliant. And again the intonation was almost spot on as fitted and easy to adjust. If your Tune-O-Matic rattles it will sort that out too.